GENEVA - Chinese Olympic judo gold medalist Tong Wen won her appeal Wednesday against a two-year ban for a positive clenbuterol test that she blamed on eating contaminated meat. The Court of Arbitration for Sport overturned the suspension imposed by the International Judo Federation, citing a "procedural failure" in the laboratory tests, and reinstated her as world champion. "Tong's results at the 2009 World Championships are reinstated, she is to retain the gold medal won at those championships and she is to be reinstated to sports participation with immediate effect," the court said in a statement. However, the verdict "should not be interpreted as an exoneration of her. In particular, the panel is not declaring that (Tong) did or did not, voluntarily or not, ingest clenbuterol," the ruling stated. Tong tested positive for the muscle-building, fat-burning drug after winning the over 78-kilogram category at the August 2009 worlds in Rotterdam, Netherlands. The judo federation later ordered tests on her backup "B" sample - which also had clenbuterol traces - without telling her or giving her the chance to attend the tests at the World Anti-Doping Agency lab in Cologne, Germany. The CAS panel of three lawyers "recognized that the right of the athlete to be present applies whenever the 'B' sample is analyzed, irrespective of who asks for it." CAS said "no doping violation has been established" because the unofficial "B" test was not a valid confirmation of the original finding of clenbuterol. Tong denied knowingly using the drug and blamed the failed test on eating contaminated meat. She initially asked for her backup sample to be tested but withdrew her request "following the advice of the Chinese Judo Association," the court said. 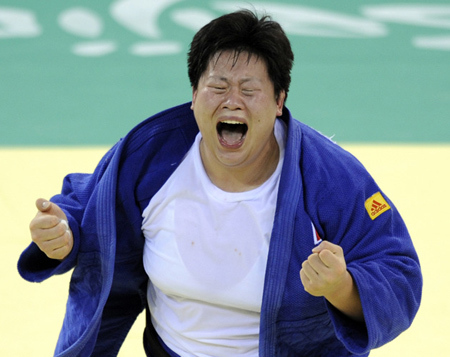 The judo federation went ahead and ordered the tests in November 2009, and suspended her five months later.